Arrupe, the Jesuit general, first met the pope in January 1981, and again in April, but no compromise was reached. And John Paul II was shot, in an attempted assassination, the very next month – May 13, 1981! It is true that the Soviets were heavily implicated in this attempt on his life; but there can be no doubt whatsoever that the Jesuits had a hand in directing it. But it failed; and what happened next? Arrupe himself suffered “a sudden massive heart attack” just a few months later in August, which failed to kill him but left him partially paralysed for the rest of his life. A deadly game was afoot between the pope and the Jesuits. The Jesuits (via contacts within the Soviet sphere) tried to murder the pope, and the pope (via his allies, possibly within the CIA) tried to murder the Jesuit general. So let there be no doubt in anyone’s mind of Francis I’s position. He is a faithful Jesuit under orders to his general. He serves his general with blind obedience. But if at any time he tries to go his own way, he will be severely dealt with in any way his general sees fit. And murder would not be excluded. But thus far Francis has shown every sign of servile obedience to the Order to which he has devoted his life. With the election of Bergoglio to the papal office, the Jesuits came into total control of the Vatican, and of the Roman Catholic institution worldwide. These are extraordinary times indeed. 1. He is a Jesuit! Francis I is the first openly Jesuit pope. When he was elected his new coat-of-arms, each symbol having a meaning, was revealed to the world. Prominent is a blue shield; and in this shield is the emblem of the “Society of Jesus”, most hated and feared of all Roman Catholic religious orders: a radiant, blazing sun containing the letters, IHS, in red, which they tell the world is the monogram of Christ. 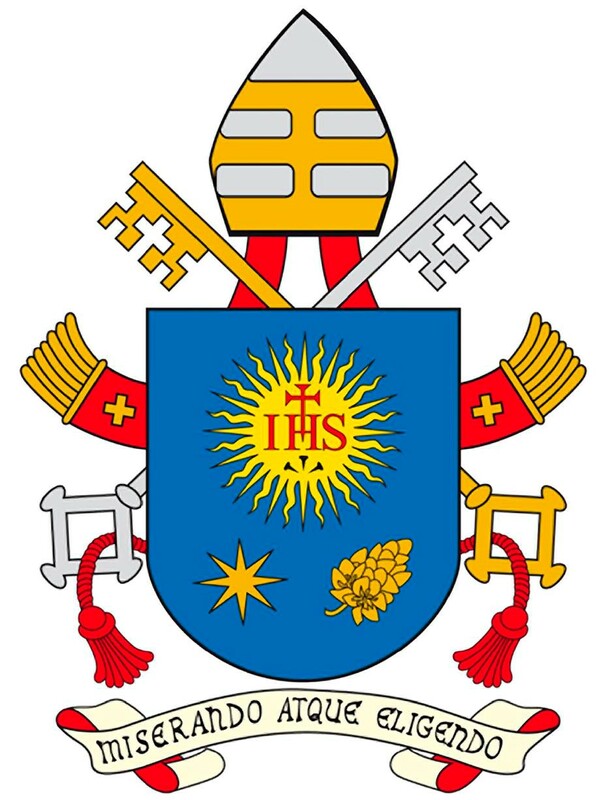 And thus does the emblem of the Jesuits now sit proudly within the coat-of-arms of the Roman pontiff! Clearly the Jesuits felt the time was ripe to openly raise one of their own men to the papal throne. And knowing how they operate – knowing that this must have been planned long beforehand – were they, then, behind his predecessor Benedict XVI’s sudden resignation? Oh, we can be sure of it! It is beyond question. Benedict’s resignation had nothing to do with his supposed shock and sadness about a so-called “gay lobby” within the Vatican, as the media enjoyed reporting. After all, as a man who rose through the ranks, from priest to pope, Benedict was fully aware of the huge numbers of sodomites within the priesthood. This would have come as no surprise to him and would never have forced him to resign. Yes, his age and health were part of the reason; and yes, very possibly the false “prophecy” of Malachy was another part of the reason; but he had clashed with the Jesuits before, and they wanted a Jesuit to replace him. When the “Vatileaks” business erupted, involving Benedict’s own butler who stole his documents, beyond question on the orders of others behind the scenes, Benedict told some Germans who visited him that the butler had been giving him his medicine too; and Benedict would have in all likelihood feared for his life. And known who was behind it all. Whether Benedict was willing to depart on their orders, or whether they forced him out, they were involved. Deeply involved.